Unfortunately, in our opinion you know as much as a good official, but much *SoS* don't know very well you and so we had to get you in the academy! !But i hope that you soon participate in the training, we integrate with the group and soon you will become official!! Also, I noticed that in recent months have made ​​many requests to different clans ... I hope that you will not leave this clan and we do not disappoint! When you accept the accademy i add you in (sos) player! We spoke yesterday some phrases and I hope you will benefit this big chance to be an SoS. Is it possible for you to join our Mumble channel? If you have questions... Please feel free to ask me. And please read the rules... but I know you are a friendly Player. I hope we will have a lot of fun together! For now i add you in clan (sos), for the name in game NP, in the forum i know that you can change, but i don't know how as!!!!! Welcome and see you in game. Assy uses mumble too, and he is a quite player just because he does not know how sounds our italian speech, but Assy, as you, knows some italian word. I think is a good chance to learn our speech very quickly, moreover mumble is useful to suggest quickly how to move in game in order to have a successfull team. If you can/would not use mumble you are free to stay without it to play togheter, but I suggest you just to try mumble, one or two times. The same is gametracker, if you want .... lol Mario I know what are you thinking about. We are a democratic clan. I will reinstall mumble but what is game tracker ? a sort of stats? gametracker is explained in www.gametracker.com, and yes it is for stats...it gives you a banner which can be useful only with an application named gametracker lite that you should install and configure, it is for windows. However maybe you can use it with wine in unix OS. If you register and login in gametracker.com simply by registering in gametracker tell me your nick in gametracker that I will add you at the team SoS made also in gametracker. I have registered me as nick Daltox . I must start Game Tracker Lite and launch OA with it to have stats , right ? Then go to your page in www.gametracker.com/Daltox and copy your banner URL image located in the bottom of your page[ http://cache.www.gametrac......C00.png ](if you want, cancel "cache." and let "www.gamet....png") and paste this URL image in your profilo in this forum, or others forums, as you like. paste it in your profilo->firma paste it in the textarea and ALL DONE. THE END! ALL this just if you want. Sì è esatto Daltox. Tu sei stato bravo, un buon esempio perchè gli altri membri sos sembrano non volere aderire alla mia proposta fino ad oggi. Da oggi spero vorranno fare quel che ho chiesto, ovvero solo registrarsi a gametracker e riferirmi il loro nick. Yeah is right Daltox. You have been "WOW", a good example because the others sos members seem to have not in will joining to my suggestion until today By you I hope they will do that I asked them, that's just registering in gametracker and tell me their nicks. I want just to increase the number of members to make to show in the SoS banner, for now we are 5 members with you. Thank you very much. If you managed to do this for me You can install mumble and use it for all SoS, especially for Assy and Adriano who are german. I mean I hope I will meet you in mumble. I have mumble , Think you just have to give me adresses and passwords but as I said , I only can hear you speaking and can't speak myself ..
Io non so discernere nel nostro forum il privatissimo che non ho dal privato e dal pubblico. Aiuto! EDIT: non è che non mi fosse già stato spiegato anche bene quali sono le parti private... non ci ho pensato però perchè era daltox... e cioè non ci ho pensato perchè sai i tre post che compaiono in avviso&importante in tutte le sezioni che si aprono qua... mi hanno confuso e credevo che non avessero a che vedere con quello che stava nel riquadro "privato"... Scusatemi... spero solo non sia stato visto da nessun estraneo nel frangente di tempo che è stato esposto in pubblico. Farò più attenzione. Mi leggo tutto quello che trovo in privato per non confonderlo in futuro con altra roba. 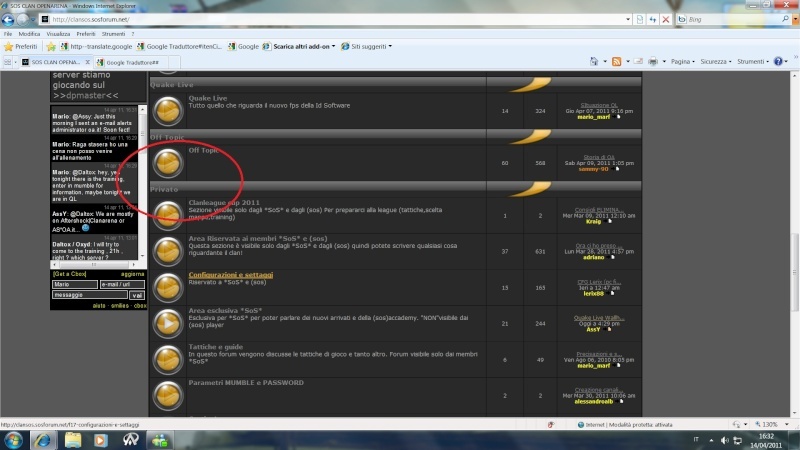 se clicchi in "home" qui in alto nel menù orizzontale ti si aprono tutte le "sezione del forum" verso la fine c'è una sezione chiamata "privata"...bene tutti i topic li dentro sono PRIVATI esclusi *SoS*, oppure *SoS* e (sos). In pratica li possiamo leggere solo noi. In alternativa, se vuoi per informazioni private puoi usare i PM. Per scrivere un PM basta cliccare "Messagerie" sempre sul menù orizzontale qui in alto.